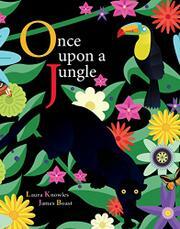 A jungle ecosystem is described in words and pictures in this picture book. The story begins, “Once upon a time, there lived a jungle”—the word “lived” setting the tone for the book’s theme of the jungle as a living thing, and this marvelous textual precision continues. The text is succinct, with only a few words per page, and the illustrations are clean and stylized with bright colors against a black background, but their sum total is a marvel of economy, clarity, and breadth. The beginning pages tell of the ants, who are preyed on by the mantis, who in turn is hunted by the lizard, and as the story continues, the illustrations pull farther back in scope, with repeating features, such as a butterfly, to anchor them. Attentive readers will find layers of creatures and plants within the illustrations, amplifying the idea of the layered life of the jungle. As the story concludes, the text loops back to its beginning, giving readers an understanding of the circularity of the food chain. The book ends with two gatefolds, both skillful summations. One is an expansive three-page illustration of creatures that live in the jungle, and the other presents a clear, logical explanation of a food chain.